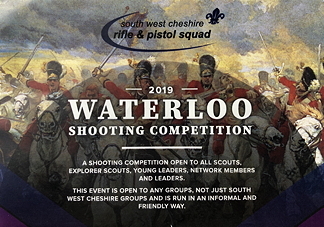 Booking via this site is only open to members of the MW Shooting Squad. The fee includes main event entry, camping fees, food and transport to/from the event and commemorative badge. The Mersey Weaver TSASU will be supervising and handling the logistics of the MW Shooting Squad entrants. We will meet at the District Scout Centre on Friday evening then travel in the District minibus to Milldale, camp over Friday and Saturday night and return last Sunday afternoon. The District Shooting Advisor will be the Nights Away Permit Holder for the Squad. Parents will need to complete a Nights Away Permission form and a TSASU Shooting Permission Form Once Only ARP03.